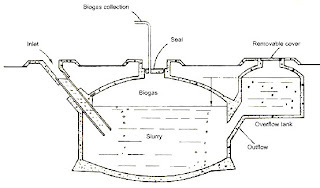 Anaerobic Digester perform some pretty basic functions, but also generate electricity and heat from the resultant "bio-gas". Primarily they are a depository for all kinds of waste, from food waste to human waste, and from spoiled crops to animal slurry. From this cocktail a bio-gas is derived which is primarily methane or natural gas. Admittedly dependent on the mix there is CO2 and hydrogen sulphide as well. From the resultant gas, a Combined Heat and Power plant can be run to give 1 part electricity to 2 parts heat. Now in very hot climates the heat can be utilised to produce chilled water for air conditioning. In the 1980's Some 6 million anaerobic digesters were set up in China, which became the biogas capitol of the world, attracting many from the developing countries to learn from it. The ‘China dome’ digester became the standard construction to the present day (Fig. 1), especially for small-scale domestic use. But many new types of rural household digesters have also been built based on water pressure, as for example, the plug flow auto-cycle rural digester, the up-flow small scale digester, the fender digester, and recently, the pulse flow anaerobic reactor. 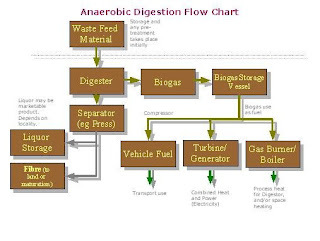 Anaerobic Digesters: Electricity, Heat and Cooling from Rubbish? is the process by which waste organic material is broken down into more acceptable components, such as bio-gas and fertilizer. It is the same process used in a sewage works, and it will work with many differing materials, although woody material is less suitable. However this application can bring electricity, hot water and cooling to small scale application, such as a group of houses. All fed from waste materials from food waste to farming wastes and animal dung. Perfect for emerging nations, farming communities, and people without grid electricity. Sun Earth Energy can supply the equipment and expertise to roll out this "super green" technology on a regional and national basis. We feel it is ideal for African Nations where the higher mean temperatures make the digestion process (which only works above 37 C) far more effective and productive. And for goodness sake please do not tell anybody that you can run a car on this stuff!!! "The shield building is the outer housing that covers both the plant's core and an inner containment shell. The shield not only has to protect the reactor from severe weather such as earthquakes and hurricanes but also has to support a tank of roughly 2700 tonnes of water used to cool the reactor in the case of an emergency. The NRC certified a prior version of the reactor in January 2006 that had a shield made of cement reinforced with steel bars running through it. After the design was approved, however, the NRC added an additional requirement for the shield building to withstand the impact of an airplane crash." So to make the shield building airplane proof has to be a big cost increase. Which is why Sun Earth Energy has always favoured small scale generation plant. By having lots of smaller human scale plants based on renewable power and by demand reduction techniques [such as solar assisted air conditioning plant to give 50% plus electricity savings - see picture and 100% solar hot water systems - SEE Hot Water picture in green] means that each community has more control, big and complex grid networks can be avoided, and outages become less of an issue. Of course this makes life a lot more difficult for power companies as would have to deal with far more complexity in terms of many many more smaller plants. Alternatively we could turn back the clocks 60 plus years and have these smaller plants owned and maintained by the local municipalities. With exporting excess power back into the existing grid, the grid administration has far more back up power at its disposal run by computers. More importantly municipalities could also co-ordinate waste collection, sewage and electricity which together are mutually beneficial. Link this to Tri-generation of power, cooling and hot water you have the self contained city. This is the future of the developed world and the future of the emerging nations. The only losers are the big engineering firms and the oil industry. However even these can change their market profiles. Engineering firms could focus on smaller engineering solutions to co-generation and tri-generation of energy as some already do. The oil firms need to move into energy production, its going to be a lot easier. Co-Generation and Tri-Generation processes aim to maximise fuel energy conversion efficiencies. Normally in electricity generation with fossil fuels or bio-fuels only 25-30% of the fuel energy is transformed into electricity. This is because of the heat produced from combustion to turn a steam turbine or such-like can only utilise part of this energy. 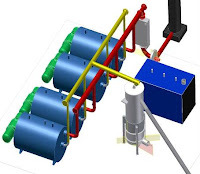 The image here uses a Stirling Engine (Green) to turn heat into mechanical energy which in turn can produce electrical energy. Here 4 sets of 35kWe Stirling Engines being run from wood chip gasification (grey tower with yellow wood-gas pipelines). Each boiler (light blue) also produces 160kW of heat energy, which can provide heating water or a combination of heating water and chilled water for air conditioning. By use of an absorption chiller, heat can generate cold! LS9, the Renewable Petroleum Company(TM), today announced a major breakthrough in the ability to make cellulosic-derived advanced biofuels. 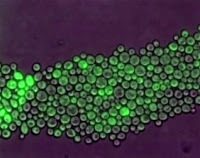 A collaborative team of researchers from LS9, Inc, the University of California at Berkeley, and the U.S. Department of Energy's Joint BioEnergy Institute (JBEI) have developed a microbe that can produce an advanced biofuel directly from cellulosic biomass in a one-step process. Using the power of synthetic biology, the team of researchers engineered a microbe that consolidates advanced biofuels production and cellulosic bioprocessing for the first time. This breakthrough enables the production of advanced hydrocarbon fuels and chemicals in a single fermentation process that does not require additional chemical transformations. "This breakthrough is a significant step toward the development of scalable, low-cost drop in compatible cellulosic fuels and chemicals," said Dr. Stephen del Cardayre, Vice President, Research and Development, LS9 Inc. "Combining LS9's single-step advanced fuel and chemical fermentation processes with cellulosic bioprocessing will enable the production of petroleum replacement products at lower costs and with significantly lower carbon emissions than current petroleum-based fuels and chemicals." The team of scientific collaborators that included LS9 scientists Zhihao Hu, Andreas Schirmer, Amy McClure, and Stephen del Cardayre, and the U.C. Berkeley and JBEI team of Eric Stein, Yisheng Kang, Gregory Bokinsky and Jay Keasling, have published the results of this research in the January 28, 2010 edition of the journal Nature. The paper is entitled: "Microbial production of fatty acid-derived fuels and chemicals from plant biomass." "This was truly a team effort that demonstrates the strength of combining academic, government, and industrial efforts and the importance of grant programs, such as the UC Discovery Grant, which support them," added Jay Keasling, Professor of Chemical Engineering at the University of California, Berkeley and Chief Executive Officer of the Joint BioEnergy Institute. LS9 is the low-cost producer of renewable advanced diesel products. LS9's UltraClean(TM) Diesel is the only finished fuel directly produced by fermentation of renewable raw materials in a single step. The company's proprietary one-step process has higher yields and removes additional production costs associated with the multi-step processes required by other renewable diesel technologies. LS9's technology also results in superior products that are designed to uniquely achieve optimal overall performance. A leader in synthetic biology, LS9 genetically engineers microorganisms to precisely produce fuels to have desired properties such as cetane, volatility, oxidative stability and cold-flow, while offering an 85% reduction in greenhouse gas emissions when compared to conventional diesel. The published research demonstrates how the LS9 organisms can be further engineered to directly convert biomass to these advanced fuels and chemicals. "LS9's single-step production technology already positions LS9 to be the low-cost producer of low-carbon advance biofuels using first generation feedstocks such as sugar cane," said Bill Haywood, Chief Executive Officer, LS9, Inc. "This amazing breakthrough represents a significant advancement toward the low cost production from cellulosic biomass, which will lead to greater reductions in greenhouse gas emissions, lower-costs, and an ability to leverage abundant non-food feedstocks throughout the world." The team of collaborators will now jointly work on optimizing the efficiency by which their engineered microbe can convert cellulosic biomass into advanced biofuels. This research was supported by funds from LS9, Inc. and the UC Discovery Grant program. The UC Discovery Grant program is a three-way partnership between the University of California, private industry and the state of California that is aimed at strengthening and expanding California's economy through targeted fields of research. JBEI is one of three Bioenergy Research Centers funded by the U.S. Department of Energy to advance the development of the next generation of biofuels. Headquartered in Emeryville, California, JBEI is a scientific partnership led by Lawrence Berkeley National Laboratory (Berkeley Lab) and includes the Sandia National Laboratories, the University of California (UC) campuses of Berkeley and Davis, the Carnegie Institution for Science (located on the campus of Stanford University), and the Lawrence Livermore National Laboratory. Ready to lay the foundation for a clean energy economy in Africa? We are searching for devoted and enthusiastic individuals in Africa ready to lay the foundation for a clean energy economy that will create a new generation of jobs, reduce dependence on oil and enhance national economic growth and optimize the use of natural resources. It is time for the Leaders & Governments of Africa to act efficiently, transparently and use the existing programs already in existence. The African Nations needs to take critical steps to transform their continent into a regional clean energy leader. How can this be done? First we need commitment from the African Nations to allocate large investments in clean energy, implement efficient use of natural resources and promotion programs in order to leverage private investment and fostering African innovation and ingenuity. The National and Regional investments for clean energy will, if handled efficiently, be able to produce billions of US$ in clean energy projects, which in addition will attract investors in industry and tourism. These investments can be designed to accelerate investments in clean energy projects and pull private investments onto the game field. They can be used to jump start a major transformation of African energy systems including unprecedented growth in the generation of renewable sources of energy, enhanced manufacturing capacity for clean energy technology, advanced vehicle and fuel technologies, and a bigger, better, smarter electric grid. SEE can help to develop, finance and implement the National strategies and plans towards a clean energy economy. Here is an extract from the Seawater Greenhouse designers on this simple but highly effective concept that can bring greenery and fresh water to the deserts of the world. The Seawater Greenhouse uses the sun, the sea and the atmosphere to produce fresh water and cool air to assist in the growing of crops. The process recreates the natural hydrological cycle within a controlled environment. The entire front wall of the building is a seawater evaporator. It consists of a honeycomb lattice and faces the prevailing wind. Fans may need to assist and control air movement in very hot locations. Seawater trickles down over the lattice, passively cooling and humidifying the air passing through into the planting area. Cool air passes through the planting area and then combines with hot dry air from the roof cavity. The mixture passes through a second sea water evaporator creating hot saturated air which then flows through a condenser. The condenser is cooled by incoming seawater. The temperature difference causes fresh water to condense out of the air stream. The volume of fresh water is determined by air temperature, relative humidity, solar radiation and the airflow rate. These conditions can be replicated in the thermodynamic model and, with appropriate meteorological information, the detailed design and performance of the Seawater Greenhouse can be optimised for every suitable location and environment. Its really very disappointing to hear all the 'experts' arguing whether global warming is real or not; we even have the view posted that it's some form of "enemy" plot to corrupt the climate change proponents (how or why is unclear); my take is WHO CARES! WE NEED TO USE RESOURCES EFFICIENTLY AND WISELY. PERIOD. That means oil, gas, coal, have to be consumed efficiently and used to their best effect. This might even mean that oil and gas are used to make plastics, or even as a medium for foodstuffs. It may mean we cannot accept the pollution risks, the risks in extraction, the environmental impacts on a personal level. The point is that renewable energy and energy efficiency are very worthy causes without any issues on climate; which if true makes these topics even more relevant. I mean who reading this is happy to pay their ever rising electricity bills or gas bills, why can't we have some credible alternatives, why can't we take control of our own energy needs, even at a personal or community level. The answer is solar thermal, the answer is solar PV, the answer is wind, wave, osmotic, geo-thermal etc, etc, etc. 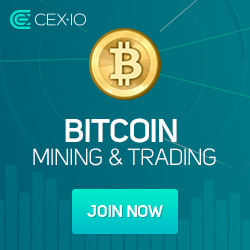 The technology is good enough right now AND IT WILL GET BETTER. Vested interests at the Corporate and Government levels are holding this all back. So at Sun Earth Energy we say "demand change now, demand more choice, demand energy independence, go it alone if you have to, but lets see some real change"